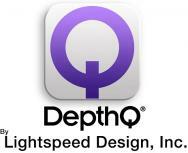 DEPTHQ® by Lightspeed Design, Inc.
DEPTHQ® by Lightspeed Design, Inc. is an experienced and trusted technology provider who has successfully commercialized numerous products, including 3D digital cinema equipment and virtual reality. DEPTHQ® 3D technology is now being used in hundreds of digital cinemas in the UAE and Middle East, with 2,500 screens worldwide. DepthQ® VR is an immersive 360° film experience enhanced with interactivity, that captures the viewers' attention to deliver compelling and memorable experiences.